There is something going on right now in Europe and the Middle East called the Syrian Refugee Crisis. Due to the terrorist group ISIS—Islamic State of Iraq and Syria—and the Syrian government, millions of refugees are trailing out of Syria, heading for Europe. On September 14th alone, 9,380 refugees crossed into Europe. Though the European countries reacted in a variety of ways, not many of them were very welcoming. On Tuesday the 15th, Hungary filled in their bordering gate with Serbia, leaving thousands of migrants on the Serbian side of the gate calling to be let in. 275 people were arrested at the border for trying to enter illegally. Countries claim they’re acting this way because taking in millions of people would drain their resources, giving them serious financial issues. And yes, it would. But financial issues are something that can be changed. Deaths are not. Children are sick and dying on the border of these countries, not allowed to come in. Some kids have tried to swim to Greece and drowned. When it comes down to it, which is worse: financial issues or being the cause of deaths of hundreds of thousands of innocents? We do so much to support human life, yet when wills are tested and lives are ACTUALLY on the line, few countries step up to try to help. It makes you wonder: Is this really about financial issues, or are people simply afraid of a change in society? Letting the refugees in would bring not just an influx of newcomers, but also a major change in race and religion. That must be hard to accept, but when it comes to millions of people trying to be let in, hundreds who have already died, you have to think: Which is more important, stopping change in society or saving lives? Lives that can feel pain, and are feeling pain right now because not enough countries are willing to help. Another factor might be that the Syrians are Muslim. Because terrorist groups like ISIS claim to be Muslim, some people automatically assume that all Muslims are terrorists. That assumption is both completely wrong and very racist. The vast majority Muslims are innocent, peace-loving people, and it is wrong to think that just because some extremists within a religion commit acts of violence or terror, everyone else will too. That is NEVER the case. People should be judged for their actions only, and not their religion. Unfortunately, some people in the European countries do judge the Syrian refugees based on these stereotypes, and this attitude is, in large part, responsible for the refugees’ not being allowed across the border, and the deaths of so many innocents. Lives are ending, but they don’t have to! It is only this xenophobic attitude and intolerance of other races, religions, and countries that is preventing the refugees from being allowed to cross into safety. In my opinion, saving lives is more important than any qualms you might have with someone. These people are innocent and many countries can save them. Why don’t they? There is a terrible civil war happening half way across the world at the moment. Thousands of Syrians have been killed in this conflict; millions have been displaced, and are fleeing to any safe havens they can find. For many years the West has turned a blind eye towards the atrocities and horrors that have taken place and are still taking place in Syria. Many Europeans and Americans were unaware of the level of desperation that Syrians have reached. It wasn’t until a photograph of a three-year-old by the name of Aylan Kurdi was seen by the media and rapidly circulated that many peoples of the world began to understand the plight of these Syrian refugees. Aylan Kurdi drowned in his attempted crossing of the Mediterranean Sea after his parents put him aboard a raft. Warsan Shire, a Somali-British poet, wrote, “You have to understand that no one puts their children in a boat unless the water is safer than the land.” This is a truly terrifying comment when it comes to crossing a body of water that is approximately 2,300 miles long. These rafts are not cruise ships stocked with supplies, protected from the sun, and stable in a turbulent sea. These rafts are rubber boats with small motors that are designed to make short hops from those massive cruise liners to a dock. Joseph Stalin once said that “the death of one person is a tragedy; the death of one million is a statistic.” With the picture of Aylan Kurdi, the West awoke to the tragedies that are occurring in Syria and began to offer support by taking in refugees, an admirable action, even if a little late. 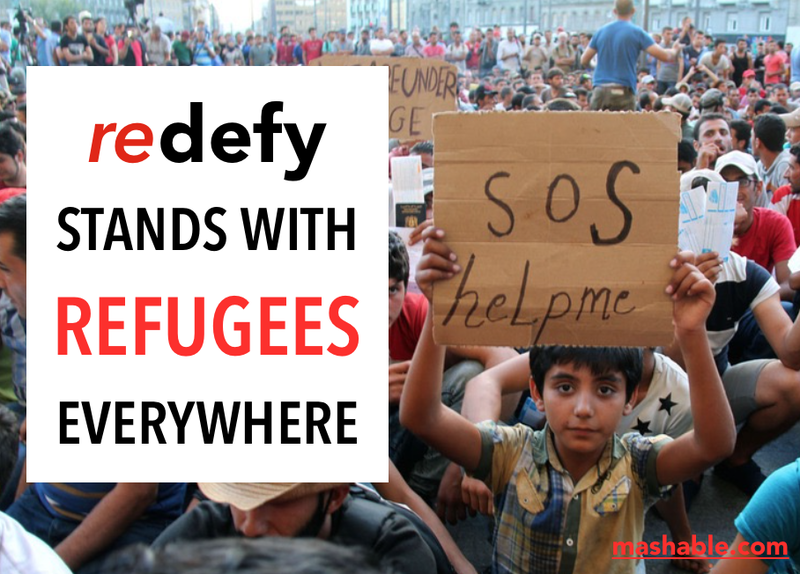 Redefy declares #REFUGEESWELCOME unequivocally. We are currently looking into ways that we can best help refugees all around the world as we recognize that we can no longer sit here and do nothing. It is time for action. There are millions of displaced Syrian refugees, and we are determind to better their condition in some way. I have personally been deeply moved by Humans of New York’s recent interviews with Syrian refugees, and I would like to reaffirm that redefy is committed to to advocating that we are one humanity before all else. Xenophobia, ignorance, and complacency have no place in our minds, hearts, or politics. I sit here trying to grapple how it is fair that I sit here safe in a bubble of privilege, while there are millions of people so desperate to survive. We can no longer allow the media, politicians, and ourselves to be clouded by misinformation. There are millions of people who need our help, who are being turned away because of ethnic-centric, discriminatory, and detrimental attidues. It is time we help them – there is no time to waste.